Some quick background. (a) I’m a fan -- both of your sporting accomplishments, and of your passion for fighting cancer & your stand that quality health care is a fundamental human right. (b) I’m a capitalist and celebrate the way in which it’s a 21st-Century fast-forwarding of the primitive manly urge to hunt & gather. (c) On more than one occasion I’ve been tangentially involved in efforts to raise money for the Lance Armstrong Foundation. Especially given the recent speech I attended by LAF CEO, Doug Ullman, here in Little Rock at the Clinton School for Public Service, I plan on continuing to be involved in these efforts. Like most, I was floored at the sums raised at Sotheby’s this week, and was impressed, too, by the mass media coverage of the auction. But a thought for your consideration: In every easily-accessible form of media (e.g. your Twitter feed and the New York Times, just to name 2 outlets) this was a ‘Livestrong’ story, not an LAF story. From an LAF strategy standpoint, I think you should consider the (unintended) negative impact of the emerging public awareness that you’re involved in two Livestrong efforts -- Livestrong.com (the for-profit Direct Media holding) and Livestrong.org (a.k.a the non-profit LAF). The amount of goodwill accumulated by the LAF is rightly massive. By sharing that phrase, ‘Livestrong’, I feel as though it may give people pause (as it did for me when I observed the media coverage of the Sotheby’s Livestrong auction). Is this a for-Direct-Media-profit event, or a LAF-fundraising-event? You and Mr. Ullman are the experts, but based on my experience I think most folks are most eager to be involved in the latter. Modern Americans live a conflicted life. They’re cynical optimists. In their worse moments they may view the slippery use of ‘Livestrong’ as a calculated (for-profit) money grab. The Sotheby’s production and the media explosion that accompanied it -- it lit me up with skepticism. Was this whole enterprise just a different type of Barry Bonds home run ball auction? 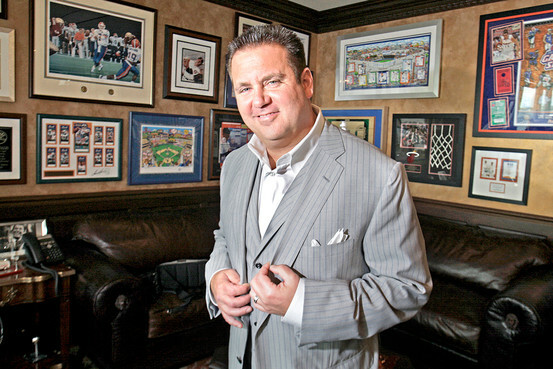 There’s something so tastelessly & cluelessly nouveau riche about millionaire sports memorabilia collectors. Without the charity component, this would’ve smacked of self-aggrandizement for everyone involved. But in their better moments -- which, after a dedicated effort is the mental place I’ve arrived -- they’ll hope like hell that next year your bikes fetch $500k a piece. How did I get to that state of mind -- the optimistic, not the cynical? It wasn’t until I went to the effort to download the Sotheby’s auction catalog and read (on page 17 of 18), the ‘Conditions of Sale’ where finally it was made clear that this was a Lance Armstrong Foundation event. It would’ve been better if this fact was clearly stated at the outset and was oft-repeated in the media. The word ‘Livestrong’ implies it, but it’s no guarantee. Long-winded, yes. But just as I want Competitive Cyclist customers to shop here with regular frequency and must constantly eliminate the hurdles to having them choose us, the LAF needs to remove the obstacles that might keep donors from giving again and again. – Amazing cyclocross videos. One here and another one here. The crowd sizes are incomprehensible. * Shimano 7900 Flight Deck computers: Cancelled by Shimano. * Campy just introduced an 11-speed 12/29 cassette, est. arrival 12/18/09. The first run of Campy 11-speed rear derailleurs will need the Campagnolo 11spd Derailleur Adjusting Insert (a $6 part, Campy part # 5-SR-004). Current 11-speed rear derailleurs will be compatible out-of-the-box with 12/29. See here for more details. * The much-awaited Lazer Helium helmet is now expected to arrive at the end of January. 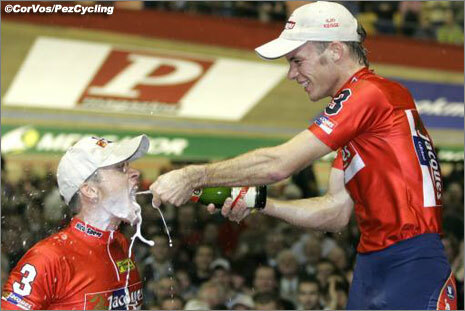 – It’s been well-documented that Cuddles is taking his act to Team BMC for 2010. Did anyone see this coming? The head-scratching factor is doubly so since it seemed to most that BMC was gearing up to build a powerhouse Classics squad on par with Quick Step’s. Hincapie, Ballan, Kroon, Burghardt -- these are guys who ride like hulks March & April. But July? They can be supportive then, but they aren’t the staff of spindly sherpas Cuddles needs to grab yellow and keep it in the mountains. I thought the whole reason he detested Silence-Lotto was because he was a Grand Tour rider stuck unsupported on a team with Classics on the brain? 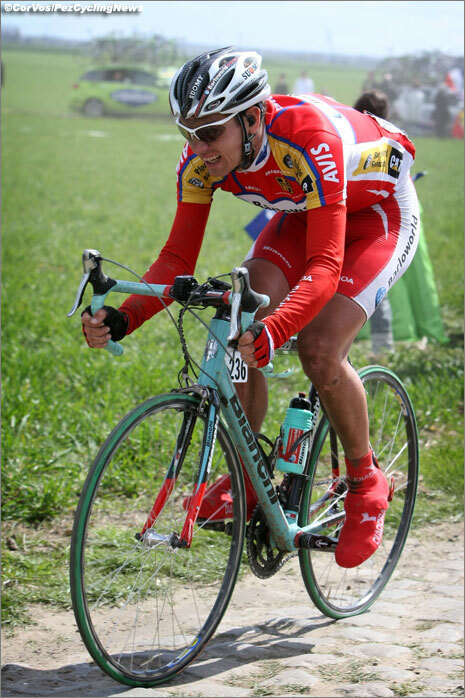 – As we mentioned a few weeks back, smarter people than us have written about the (non-) homoeroticism of bike racing life. But this photo…it probably needs a caption. But the caption doesn’t need to be here. – PRO detail spotting: High and Belgian STI levers. – An old tale told with a heightened level of detail. Rhode Island Artificial Limb Co.
– Not un-reminiscent of VDB from a decade ago. A different tale of the explosive combo of freakish athletic talent and youthful idiocy.